One of the great things about cooking is that certain meals are just so homey, warming and cozy. I guess that’s where the term “comfort food” comes from…some meals just warm you up and make you feel at home, and you really crave them when life feels stressful (or when you’re feeling under the weather). Chicken and dumplings is a comfort food for my family. Dumplings have a very long history in America. 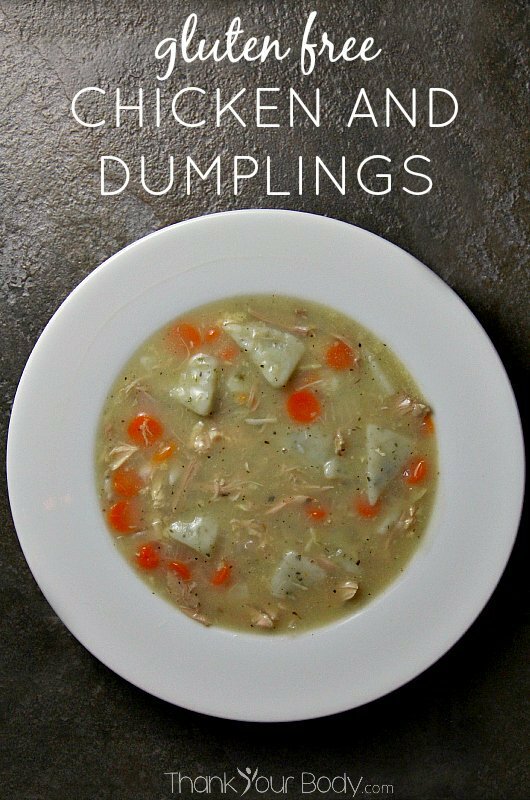 Dumpling recipes can be found in print as early as the 1600’s, but it’s likely that they’ve been used to bulk up soup for a lot longer than that! I’ve always thought of Chicken and Dumplings as a Southern dish, but variations of this meal have deep roots all across the U.S. The style of the dish varies from area to area, however. Dumplings in the South tend to be made flat, like thick noodles. In areas farther north the dumplings are thicker and more rounded (often dropped by spoonfuls into the hot chicken stew). When I went gluten free, I thought I might have to kiss this particular comfort food goodbye…but it turns out that dumplings are easy to make without gluten! Just substitute your favorite gluten free flour blend for regular flour and proceed as usual. The base for Chicken and Dumplings is a thick chicken soup or stew. One thing I love about this recipe is that it’s the perfect way to use the leftovers when you roast a chicken. Start with this great recipe for healthy roast chicken and plan ahead for two delicious meals! You can start with a whole chicken instead of leftovers, but if you add some extra vegetables a leftover chicken will do nicely. I like to boil the chicken (bones and all) for a long time, because there are so many wonderful nutritional benefits from broth made from a whole chicken. Before dinner time, I take out the chicken and pull the meat off the bones and chop it up. While I’m doing this, I put a chopped onion, some celery, carrots, and lots of garlic and spices into the broth and let that boil away. Return the chopped chicken to the pot and let it simmer so that the vegetables get soft. To make the dumplings, start with some gluten free flour (I use rice flour with a little tapioca flour most of the time. However, potato flour is a great option for this recipe as well). To the flour, add a teaspoon of aluminum free baking powder, some herbs, and a dash of salt. Then, use a fork or a pastry cutter to blend in 1/3 cup of either butter or coconut oil, until the mixture is crumbly. Mix in enough liquid (milk, buttermilk, kefir, almond or coconut milk, or cold water all work) to form a dough that sticks together enough to be rolled. Roll the dough out on a floured surface, about 1/4 of an inch thick. Here’s where you can play a little…if you’d rather have the more thin, noodle-like Southern dumplings you can roll the dough a little flatter. If you want round, Northern style dumplings, you can roll the dough into little balls instead of using a rolling pin. Maybe because I come from Southern roots but was raised in Montana, my dumplings tend to be a little bit of both…I like to roll them out a bit thicker than Southern dumplings, but I like to cut them into orderly shapes instead of dropping them in Northern style. I guess you could call them non-conformist dumplings! Once your dumplings are ready, drop them into the simmering chicken stew and then dust all the extra flour from the dumpling-making process into the pot as well. Put a lid on the pot and let the dumplings boil for about 10 minutes. They should puff up a bit, and the chicken stew should thicken up quite a bit. Give the Chicken and Dumplings a good stir, and you’re ready for dinner! Comfort food that’s easy to make, and gluten free. There are so many variations on this meal…add a few more vegetables (kale, peas, and cauliflower come to mind) or more chicken, or make a roux and thicken the stew part so that you can eat it on a plate. It’s a great way to use up leftovers from a dinner of roasted chicken and vegetables, without anyone realizing that they’re eating leftovers! 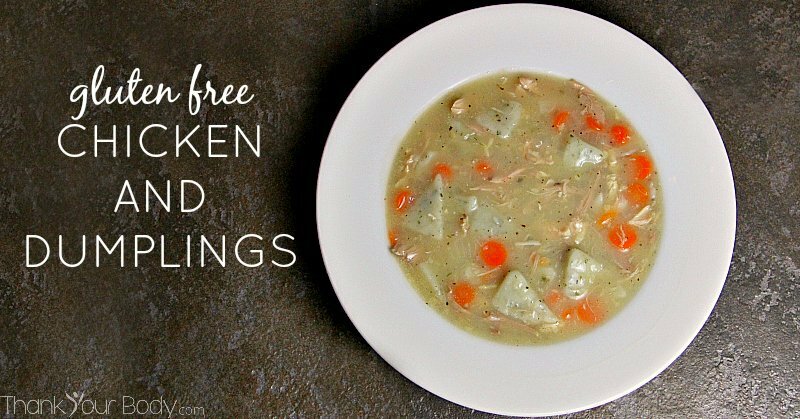 Some days you just need a good old fashion bowl of soup - you can not go wrong with this gluten free chicken and dumplings soup. Put the chicken in a large stock pot. Cover it with water plus about an inch, put a lid on the pot and bring it to a boil, then reduce it to simmering. Let the chicken simmer for at least 2 hours, but if you can keep it going on the stove for most of the day that's even better! Remove the chicken from the water and allow it to cool while you chop the vegetables. Put the vegetables, herbs, garlic, salt and pepper into the chicken stock and bring it to a boil, leaving the lid off to reduce the stock a bit. Continue to boil the stock while you remove the chicken from the bones and chop it. Return the chicken to the pot and bring the heat down to a simmer again. Let the chicken mixture simmer while you make the dumplings. If it needs a little more flavor, you can add some organic chicken base. To make the dumplings, mix together the flour, herbs, baking powder and salt together in a bowl. Add the butter or coconut oil to the flour and cut it in with a fork or pastry cutter, until the mixture resembles crumbs. Slowly add the buttermilk or milk substitute to the flour mixture, pouring in a bit at a time and stirring until you have a dough just thick enough to roll without crumbling. You may need more or less liquid, depending on the makeup of your flour...play it by ear. Pack the dough together with your hands and turn it out onto a floured surface. Roll the dough to the desired thickness (about ¼ inch thick works well) and cut it into strips or shapes. Or, skip the rolling process and roll the dough into small balls and drop it directly into the chicken. Add all the dumplings to the chicken stew and bring it up to a boil. Add any leftover flour from making the dumplings to the pot as well, and then cover it with a lid and let it boil for 10 minutes. Stir the chicken and dumplings well and serve!